Clay is a finely-grained natural rock or soil material that combines one or more clay minerals with possible traces of quartz (SiO2), metal oxides (Al2O3 , MgO etc.) and organic matter. Geologic clay deposits are mostly composed of phyllosilicate minerals containing variable amounts of water trapped in the mineral structure. Clays are plastic due to particle size and geometry as well as water content, and become hard, brittle and non–plastic upon drying or firing. Depending on the soil's content in which it is found, clay can appear in various colours from white to dull grey or brown to deep orange-red. Although many naturally occurring deposits include both silts and clay, clays are distinguished from other fine-grained soils by differences in size and mineralogy. Silts, which are fine-grained soils that do not include clay minerals, tend to have larger particle sizes than clays. There is, however, some overlap in particle size and other physical properties. The distinction between silt and clay varies by discipline. Geologists and soil scientists usually consider the separation to occur at a particle size of 2 µm (clays being finer than silts), sedimentologists often use 4–5 μm, and colloid chemists use 1 μm. Geotechnical engineers distinguish between silts and clays based on the plasticity properties of the soil, as measured by the soils' Atterberg limits. 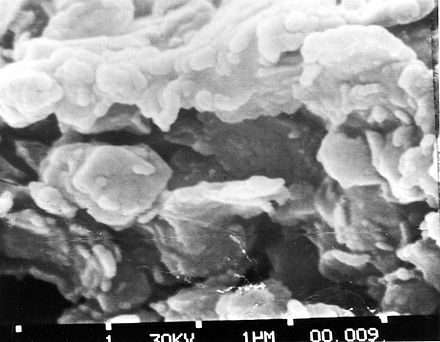 ISO 14688 grades clay particles as being smaller than 2 μm and silt particles as being larger. 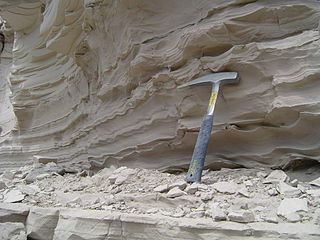 Silt is granular material of a size between sand and clay, whose mineral origin is quartz and feldspar. Silt may occur as a soil or as sediment mixed in suspension with water and soil in a body of water such as a river. 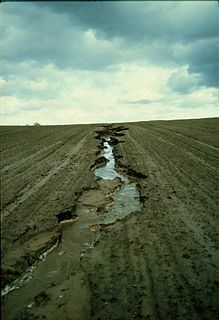 It may also exist as soil deposited at the bottom of a water body, like mudflows from landslides. 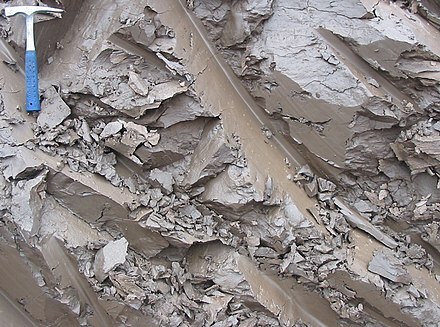 Silt has a moderate specific area with a typically non-sticky, plastic feel. Silt usually has a floury feel when dry, and a slippery feel when wet. Silt can be visually observed with a hand lens, exhibiting a sparkly appearance. It also can be felt by the tongue as granular when placed on the front teeth. 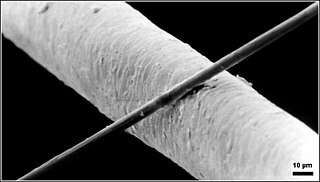 The micrometre or micrometer, also commonly known by the previous name micron, is an SI derived unit of length equalling 1×10−6 metre ; that is, one millionth of a metre. Loam is soil composed mostly of sand, silt, and a smaller amount of clay. By weight, its mineral composition is about 40–40–20% concentration of sand-silt-clay, respectively. These proportions can vary to a degree, however, and result in different types of loam soils: sandy loam, silty loam, clay loam, sandy clay loam, silty clay loam, and loam. In the USDA textural classification triangle, the only soil that is not predominantly sand, silt, or clay is called "loam". Loam soils generally contain more nutrients, moisture, and humus than sandy soils, have better drainage and infiltration of water and air than silt and clay-rich soils, and are easier to till than clay soils. The different types of loam soils each have slightly different characteristics, with some draining liquids more efficiently than others. The soil's texture, especially its ability to retain nutrients and water are crucial. Loam soil is suitable for growing most plant varieties. Clay minerals typically form over long periods of time as a result of the gradual chemical weathering of rocks, usually silicate-bearing, by low concentrations of carbonic acid and other diluted solvents. These solvents, usually acidic, migrate through the weathering rock after leaching through upper weathered layers. In addition to the weathering process, some clay minerals are formed through hydrothermal activity. There are two types of clay deposits: primary and secondary. Primary clays form as residual deposits in soil and remain at the site of formation. Secondary clays are clays that have been transported from their original location by water erosion and deposited in a new sedimentary deposit. Clay deposits are typically associated with very low energy depositional environments such as large lakes and marine basins. Carbonic acid is a chemical compound with the chemical formula H2CO3 (equivalently OC(OH)2). It is also a name sometimes given to solutions of carbon dioxide in water (carbonated water), because such solutions contain small amounts of H2CO3. In physiology, carbonic acid is described as volatile acid or respiratory acid, because it is the only acid excreted as a gas by the lungs. It plays an important role in the bicarbonate buffer system to maintain acid–base homeostasis. In pedology, leaching is the removal of soluble materials from one zone in soil to another via water movement in the profile. It is a mechanism of soil formation distinct from the soil forming process of eluviation, which is the loss of mineral and organic colloids. Leached and elluviated materials tend to be lost from topsoil and deposited in subsoil. A soil horizon accumulating leached and eluviated materials is referred to as a zone of illuviation. Clay tablets were the first known writing medium. Scribes wrote by inscribing them with cuneiform script using a blunt reed called a stylus. Purpose-made clay balls were also used as sling ammunition. Traditional uses of clay as medicine goes back to prehistoric times. An example is Armenian bole, which is used to soothe an upset stomach. Some animals such as parrots and pigs ingest clay for similar reasons. Kaolin clay and attapulgite have been used as anti-diarrheal medicines. 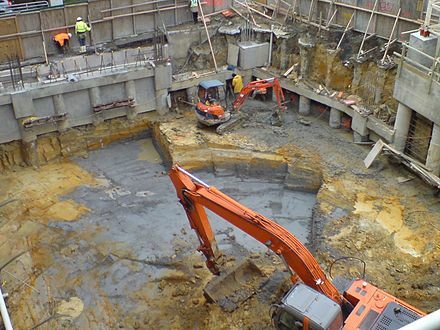 Clay as the defining ingredient of loam is one of the oldest building materials on Earth, among other ancient, naturally-occurring geologic materials such as stone and organic materials like wood. Between one-half and two-thirds of the world's population, in both traditional societies as well as developed countries, still live or work in buildings made with clay, often baked into brick, as an essential part of its load-bearing structure. Also a primary ingredient in many natural building techniques, clay is used to create adobe, cob, cordwood, and rammed earth structures and building elements such as wattle and daub, clay plaster, clay render case, clay floors and clay paints and ceramic building material. Clay was used as a mortar in brick chimneys and stone walls where protected from water. ↑ Greene‐Kelly, R. (1953). "The Identification of Montmorillonoids in Clays". Journal of Soil Science. 4 (2): 232–237. doi:10.1111/j.1365-2389.1953.tb00657.x. ISSN 1365-2389. ↑ Weems, J. B. (1904). "Chemistry of Clays". Iowa Geological Survey Annual Report. 14 (1): 319–346. doi:10.17077/2160-5270.1076. ISSN 2160-5270. Archived from the original on 3 April 2018. Retrieved 3 April 2018. ↑ Churchman, G. J.; Gates, W. P.; Theng, B. K. G.; Yuan, G. (2006). Faïza Bergaya, Benny K. G. Theng and Gerhard Lagaly (ed.). "Chapter 11.1 Clays and Clay Minerals for Pollution Control". Developments in Clay Science. Handbook of Clay Science. Elsevier. 1: 625–675. doi:10.1016/S1572-4352(05)01020-2. ↑ Grim, Ralph. "Clay mineral". Encyclopædia Britannica . Archived from the original on 9 December 2015. Retrieved 10 January 2016. Glauconite is an iron potassium phyllosilicate mineral of characteristic green color which is very friable and has very low weathering resistance. 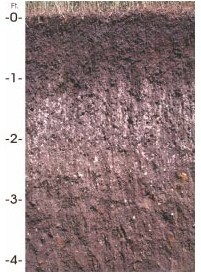 A soil horizon is a layer parallel to the soil surface, whose physical, chemical and biological characteristics differ from the layers above and beneath. Horizons are defined in many cases by obvious physical features, mainly colour and texture. These may be described both in absolute terms and in terms relative to the surrounding material, i.e. ‘coarser’ or ‘sandier’ than the horizons above and below. Parent material is the underlying geological material in which soil horizons form. Soils typically inherit a great deal of structure and minerals from their parent material, and, as such, are often classified based upon their contents of consolidated or unconsolidated mineral material that has undergone some degree of physical or chemical weathering and the mode by which the materials were most recently transported. Soil texture is a classification instrument used both in the field and laboratory to determine soil classes based on their physical texture. Soil texture can be determined using qualitative methods such as texture by feel, and quantitative methods such as the hydrometer method. Soil texture has agricultural applications such as determining crop suitability and to predict the response of the soil to environmental and management conditions such as drought or calcium (lime) requirements. Soil texture focuses on the particles that are less than two millimeters in diameter which include sand, silt, and clay. The USDA soil taxonomy and WRB soil classification systems use 12 textural classes whereas the UK-ADAS system uses 11. These classifications are based on the percentages of sand, silt, and clay in the soil.. In geology, eluvium or eluvial deposits are those geological deposits and soils that are derived by in situ weathering or weathering plus gravitational movement or accumulation. Houdek is a type of soil composed of glacial till and decomposed organic matter. It is found only in the U.S. state of South Dakota where it is the state soil. The soil series was established in 1955 in Spink County, South Dakota. It is unique to the United States, but in particular to South Dakota where it is the state soil. In geology, lamination is a small-scale sequence of fine layers that occurs in sedimentary rocks. 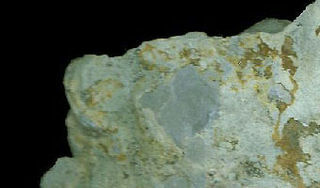 Laminae are normally smaller and less pronounced than bedding. Lamination is often regarded as planar structures one centimetre or less in thickness, whereas bedding layers are greater than one centimetre. However, structures from several millimetres to many centimetres have been described as laminae. A single sedimentary rock can have both laminae and beds. Wikimedia Commons has media related to Clay . Wikisource has the text of the 1911 Encyclopædia Britannica article Clay .